The Rainbow PUSH Coalition and Citizenship Education Fund saw a tremendous turnout of speakers, attendees, political leaders, policy makers and entertainers despite the nor’easter at the 17th Annual Wall Street Project Economic Summit. The three-day summit focused on the lock out of minorities on corporate boards, financial transactions, investment opportunities in Africa, the business of hip hop and minority ownership. This year’s summit, “50 Years After the Civil Rights Act: The Unfinished Agenda for Economic Justice...” puts equality at the forefront said Rev. 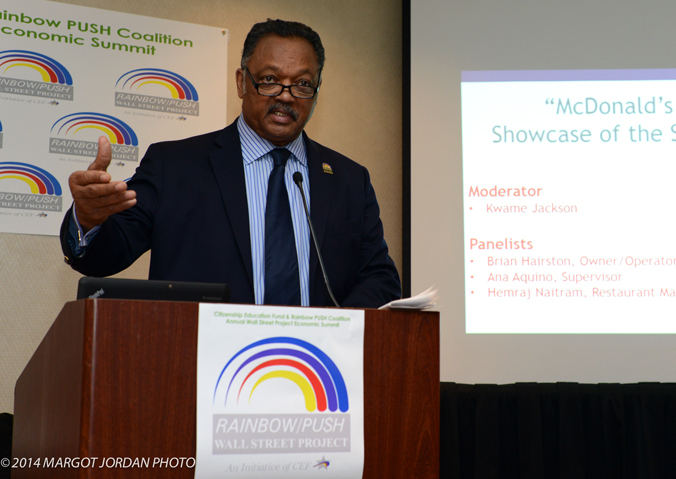 Jesse L. Jackson, Sr., founder and president, Rainbow PUSH Coalition. “I want kids to live with equal justice under the law … to have due justice and equal justice under the law.” Although it was early and many trudged through snow, all attendees said their commitment to fighting for financial equality was a must. Featured speaker Rev. Dr. James A. Forbes, Jr., Senior Minister Emeritus of The Riverside Church of New York delivered a passion felt message on the importance of the continued connection and support between the labor, ministry and community leader’s network. “Economic justice for God sales,” Rev. Dr. Forbes quoted Mathew 6:25 “do not worry about your life” as there will be economic justice for all. Rev. Dr. Forbes added that economic justice is the key to retaining the integral relationships between corporations, labor, the church and community action groups. The Boys and Girls Choir of Harlem Alumni Ensemble lent their voices as the session closed. Mabuyakhulu assured luncheon attendees Africa is open for business and is ready to invest; saying, “If you want to get the best investment there is no better place than Africa. Africa is ready to do business with you [USA]. The African of today is different than the Africa of yesterday.” Switching gears at the luncheon, famed tap dancer Jared Grimes performed a small set for the crowd, Rev. Jackson enthusiastically joined in for a few seconds of the routine. As the entertainment concluded, the luncheon continued as Rev. Jackson introduced Jacqueline A. Berrien, Chair, U.S. Equal Employment Opportunity Commission (EEOC). She took to the stage ensuring the audience her company is on top of its goal which is enforcing equal opportunity employment. “We are working to ensure that the federal government is a model employer for the nation,” stated Berrien. Rev. Jackson and the RainbowPUSH organization recently launched an initiative urging black America to “Become One in A Million,” by joining the RPC Million Member Campaign, visit www.millionmember.rainbowpush.org.